A couple years ago, I wanted to find out the name of the actor who played my favorite character on House of Cards, so I googled the character. Big mistake. The very first Google search result was the character’s House of Cards Wikia page—including date of death. I didn’t even have to click on the link. Spoiled. This post was originally published on Nov. 2, 2015. I know, I know. These are noob moves. It’s my fault I don’t know how to more deftly navigate the Internet, and serves me right for not having enough will power to stay off it ‘til I was done with that TV season or that video game. It’s 2015, and these are the rules. But, man... It’s still annoying. Spoilers are a fact of online life. And they’re getting harder and harder to ignore, thanks to the Internet’s always-open floodgate of information. But whose fault is this, and whose responsibility is it to stop the non-consensual spoiling? Should websites and tech companies have more safeguards in place to avoid spoilers, like spoiler tags? Or is it just up to fans to treat the whole internet as a toxic untouchable, until we’re totally caught up on something? The Internet creates an environment that forces you to churn through media, or else you’re left in the dust. It’s really, really easy to run into spoilers online, for recent movies, TV shows, books and games. And it’s really, really, really annoying. It’s easy to say, “Well, the Internet is huge, just stay off The Walking Dead forums for a day or two and go look at cat GIFs.” Or, “Yo, install spoiler-hiding software, numb nuts.” But all that is no guarantee. You could just be casually scrolling your Facebook feed, when your well-meaning uncle posted the fate of that popular Game of Thrones character. Or you go on Twitter and wonder why #[so-and-so]DIES is a trending topic. To be certain of avoiding spoilers, you need to seal yourself off in a self-contained bubble and plow through the work at lightning speed. Like, seriously. Rent yourself out a nice storm shelter, or fly yourself to a Siberian bunker, stockpile the canned yams, and prepare to be totally off the grid until the credits roll. Don’t even think about getting on the Internet until you’re done with it. But for most of us, that whole “stay off the Internet” argument is kinda unrealistic. It also represents a certain attitude shift in how we consume arts and entertainment in 2015: A book isn’t a leisurely escape from reality to enjoy at your own pace, it’s a cultural sprint. But how long should the rest of us wait for you to “get caught up” on a show? Should the rest of us still be waiting for you to lollygag your way through Orange Is the New Black season 1? The Internet won’t stop, just because you’ve been procrastinating with that final Zelda boss battle for half a year. I mean, if this were the ‘80s, ‘90s, or even 2000s, if you missed the new episode Thursday night, that was it. You were boned. Everyone the next day was talking about it. Since there was no real technology to watch it later (besides your clunky old VCR), the world moved on. The difference today is that, it’s not always just one episode, it’s an entire season. Some people apparently have 50 hours upfront to zoom through a book or video game, and then go online to start talking about it in excruciating detail two days after it was released. Plus, it’s social media. People are going to want to instantly talk and engage about current events or cultural goings-on. 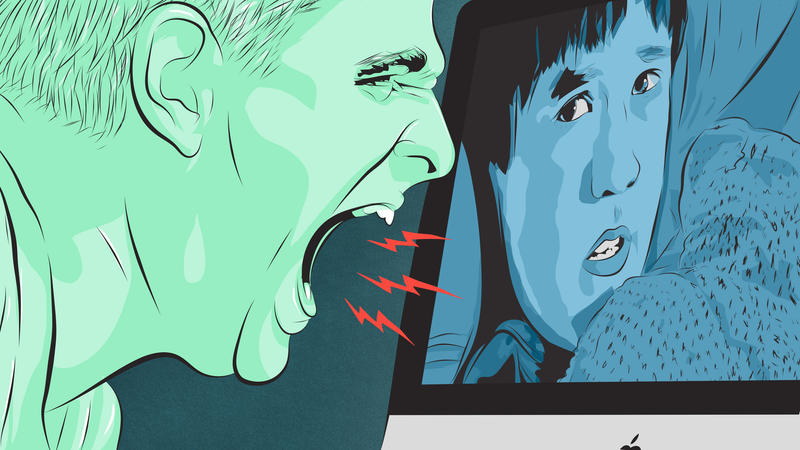 So, who’s to blame: Uncontrollable Internet discourse, or lazy fans? Here’s an example from my own life: Mad Men is my favorite show, and during its final season this year, I had missed a couple episodes, and still had to catch up by the finale. But as I was talking to a friend about the upcoming end to a TV era, they accidentally let a spoiler slip. Here’s the thing, though: I wasn’t mad at my friend, I was mad at myself. Like, if I was a big a fan as I thought I was, why didn’t I make watching the missed episodes a higher priority? I was lazy, and got what I deserved. So, when is it okay to talk about something that’s been out for a while? Back in 2008, Vulture proposed the Official Vulture Statute of Limitations: Basically, for TV shows, spoilers in the text of an article are okay the next day, but writers have to wait three days before putting them in a headline. (We could extend this to a tweet, Facebook update, etc.) For movies, you get just one month before the spoilers can appear in a headline. Which is pretty steep, considering many people watch TV and movies on DVD or services like Netflix. Needless to say, the Vulture Statute of Limitations has never been ratified by the Internet at large. And so, here we are, accepting online spoilers on social media and websites as our new reality one day. But the next day, we’re ripping our eyeballs out in frustration when we completely, unwillingly, stumble upon that rogue spoiler. Should we like, y’know, do something about it? First, people taking it upon themselves to not be assholes. Plus, websites need to step up to better spoiler-proof their entertainment infrastructure. What Can Tech Companies Do To Help? Let’s be clear: In today’s world of multinational data breaches and online harassment, a “spoiler-free zone” isn’t exactly the, uh, most crucial part of Internet improvement. But with the entertainment industry sucking in billions of dollars worldwide every year, it’s part of our user experience that we should be able to enjoy our media the way we want—including not finding out major plot twists before we experience them ourselves. So, how can tech companies and websites work harder to shield us from unwanted spoilers? A lot of online message boards and text-heavy sites like Reddit offer spoiler tags: A handy dandy bit of HTML that lets you totally black out any revealing comments, only to be made visible if a user hovers their cursor over it or clicks on the blacked-out bar. Sometimes, on the message board or CSS, it’s easy as typing [spoiler] text here [/spoiler]. More websites need options like this, and need to liberally remind people to use them. But, why aren’t there similar mechanisms on place on Facebook, Twitter, YouTube? For example: If you’re positing a vlog on YouTube in which you rant about the latest Game of Thrones death or Mr. Robot plot twist, or if you want to post a scene from a movie (before the studio contacts YouTube to yank it down, of course), couldn’t there be some similar spoiler warning that obscures the video’s thumbnail in the sidebars? “Don’t click here, SPOILER!”? I reached out to YouTube, who said there are no plans to introduce any such features. So unfortunately, the “cut yourself off from the web until you churn your way through show” method is required here. Still, there are things you can do to minimize spoiler run-ins on the site. I contacted Twitter and Facebook for comment, and while Twitter didn’t respond, Facebook suggested to unfollow your favorite shows and actors and then follow them back after you’re done with the season. And what of streaming services like Netflix and Hulu, which make full seasons of their shows available all in one go? We could probably all avoid spoilers a bit more easily if shows like Narcos and Daredevil were released the old fashioned way: once a week. That way, you don’t have to force yourself to binge the entire show in a weekend. Otherwise, you might run into a season finale spoiler that you’re still 13 episodes away from. But binge-watching isn’t going anywhere. Netflix knows it helped redefine the way people watch TV—the company even conducted a spoiler survey last year to demonstrate this. According to the Netflix survey, 21% of the over 2,000 American adults surveyed say it’s perfectly fine to reveal a major plot twist “immediately,” and that 76% of people say spoilers are just a “fact of life” in today’s world of asynchronous activity. Netflix even has an entire subsite dedicated to spoilers, complete with a personality quiz (“What kind of spoiler are you?”). At Gizmodo and Lifehacker, we’ve written a lot about how to avoid all kinds of spoilers, using apps and tricks of the trade, whether we’re talking about sports scores, tech rumors, or dweebs on social media who want to kill the fun for everyone. Big sites will bend over backwards to fight against piracy—and they should, since it’s illegal—but studios and artists don’t want their work spoiled for fans. Tech companies should approach spoiler-proofing their services with the same vigor as they do with pirated content removal. So, what do we do from here? First, we need some sort of consensus, internet-wide: That’s where the Vulture Statute of Limitations could come in. (It doesn’t include video games, but those could be treated the same way Vulture treats books: spoilers are allowed in online conversation three months after release.) We need better netiquette, some well-known unspoken rules, some roughly agreed upon timetable that dictate when we can post sensitive content that might ruin other fans’ days. Folks invest a lot of time and money in their entertainment, and other people need to respect that. Second, tech companies need to take more responsibility with the spoilers floating around their services: Give users more tools to avoid posts with certain words, titles, or phrases in them, and give people easy-to-use features they can use to hide posts they might find unpleasant—whether it’s spoilers or otherwise. Only when companies realize that spoilers negatively affect user experience will they take spoiler bomb drops seriously. Until then? It’s binge, or be left behind.